The blessed Nisf-e-Sha’ban is this Sunday and fasting is highly encouraged on this day. 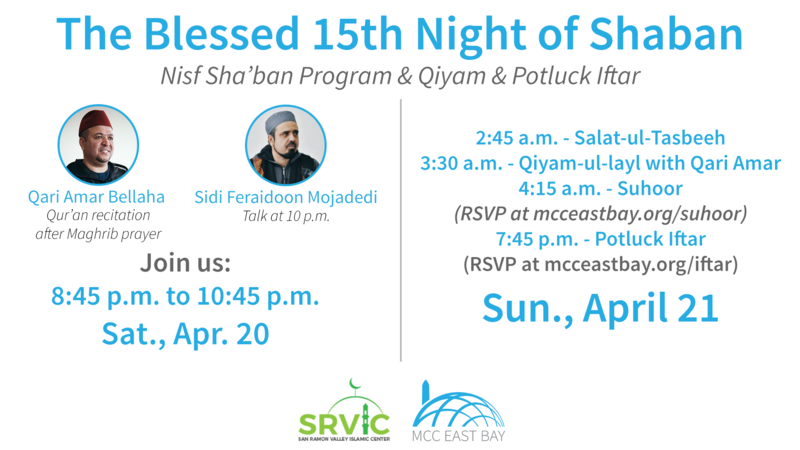 On the eve of 15th Sha’ban (Sat., April 20), join us for a joint event between the San Ramon Valley Islamic Center (SRVIC) and MCC for a program and all-night qiyam on Saturday, April 20. Here is the source for fasting on Nisf-e-Sha’ban. There are five nights when duas are accepted. According to Imam Nawawi, the night of Sha’ban (Shab-e-Barat) is one of them. Learn more this special night at here, here, and here.